I thought with summer coming up it would be time for something a bit different, something a bit hotter. So I present to you Black Mountain Brewing’s Cave Creek Chili Beer. This offering out of Arizona was made for a decade from 1989 to 1999. The Black Mountain Brewery has since closed but you can still get this offering as it is made in Mexico now. 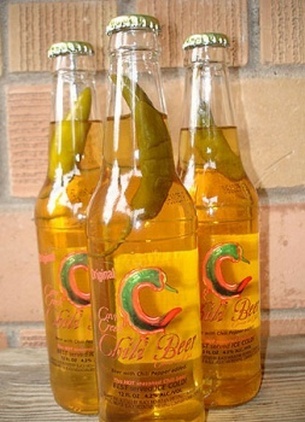 While I am not a fan of all things hot and spicy the whole green chili in the bottle was enough to entice me to try it. I decided that if they were going to put a chili in the bottle I figured I would drink it out of the bottle. This chili concoction is 4.5% and a pale yellow. It tastes like a cheap lager and smells like chili that has been left submerged in water. This first sip I didn’t really notice much in the way of heat but as I continued through the bottle it got hotter and made me feel sicker. The lager was just mild in bitterness. To be honest this was one of the most disgusting things I have ever tried. I enjoyed Outback Breweries Chili offering much more. Final verdict: 5 out of 10 and only because it was interesting. I would never buy it again. ← Pilsener Preview: Red Angus Pilsener.